I'm glad she's going to be OK. Our vacation wasn't quite that drama-laden, but that won't stop me from taking a whole week to write and post about it in daily installments. We'll have to get to Branson one of these days. My kids love themselves some mutant vegetable. Great Googley Moogley! That's one colorful child-foot. Hey! 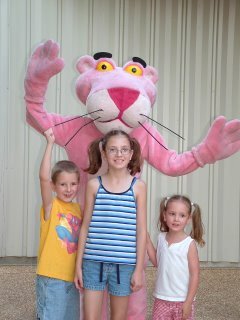 The last time we were in Branson, we, too, ended up at Skaggs. We went at 2:30 a.m., you silly goose. By cracky, there's no waiting then. The ER nurses gave the kids the TV remote, seeing as how we were the only people in the waiting room. They even gave them pillows and blankets. I can't remember when we left, but it was well into the daylight hours. Oh...the reason? It was just HH, having a kidney stone. That man needs to drink more water. He isn't the first man ever to have a kidney stone, you know. OMG! Talk about vacation from hell! Glad to hear that Abby is going to be OK. That looks nasty! You my friend have experienced the makings of a Coach Family Vacation. I swear if it's totally off the wall, Nati will get it and out of town! Oh poor kiddo...glad that you guys had it taken care of though..sorry it cut the vacation short! Poor Abby! When daughter Magnet was 2 she got a "thingy" like that on the back of her heal. Except it covered the entire back of her heal. It was horrible! Get better Abby!!! Fark a duck!! That's such bad luck for the little girl. I remember when I was a kid my kids brother stood on a box thorn and it got lodged in his heel. It was about 3 mm in diametre and 2 inches long!! My mum broke it off, a big no-no!! Then she tried to dig it out..then she put the Dr Thar's Drawing Ointment on it with a bandaid. He ended up in the kid's hospital the next day with the same symptoms as your little girl there. He was put on IV anti's , and the foot opened up under GA. I guess it is why I wanted to be a nurse..he was always in hospital for things like this..aswell as asthma and croup. Sounds like the many "emergency room tours" we took on vacation when our kids were little. The ones with my son usually involved blood or broken bones or both. Now an all important question from a Branson newbie -- we want to take our grandson there for a weekend (5 years old) Celebration City or Silver Dollar City? Hillbilly Mom, my other two kids had to suffer through Bonanza because some really hateful nasty man wouldn't give up the remote. We'll make sure we plan the next one during the night. Sounds like more fun! Mrs.Coach, that actually crossed my mind at one point - "So this is what Mrs. Coach feels like!" Anne, thankfully it didn't really change our plans too much. We missed out on some shopping, but it probably wouldn't have been much fun with Mr. Diva anyway, lol. Anonymous Magnet, hey, I'm not sure anything would be worse than when Daughter Magnet had the eye infection and was allergic to the ointment! That was HORRIBLE! Cissy, Silver Dollar City has a lot more to offer the little ones. We really thought there'd be more kid rides at Celebration City. Poor little Kady (4 1/2) only rode 3 rides! And my sister's kids (7 and 8) were too short for a lot of them as well. So I'd say if you're going for kid ride-ability, I'd go with SDC. And I should probably say that the office gal and the triage EMT were fabulous at Urgent Care - it was just the doctor that was a jerk! It seems you've passed on the splinter magnet to your daughter. I'm sure you remember that ginormous one in your leg from the old gym bleachers. Ouch. Poor Abby! I'm sure she acted a little more civil than I use to when I was her age and my Dad came after me with his pocket knife and a needle to dig out one of those huge honey locust tree thorns. Seems I stepped on one EVERY SINGLE SUMMER. Some times more than once a summer. Geez, you'd think I'd learn to wear shoes or something when I walked around outside. 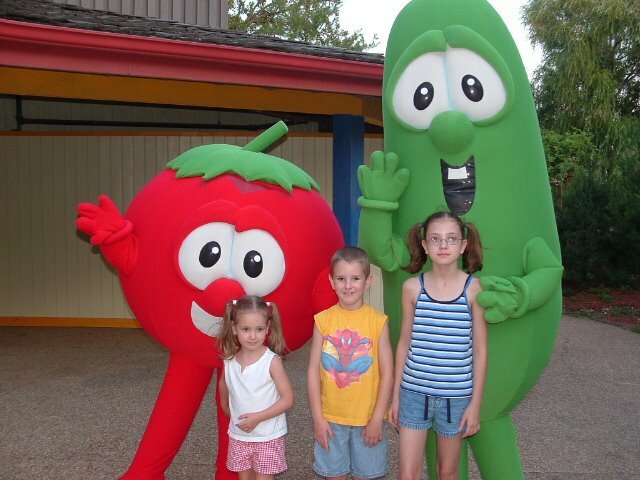 Has anyone told you (no offense) that two of your kids look like a tomato and some sort of green cucumber? Oh wait, I just put my glasses on. Never mind. SDC just opened half a dozen kid's rides next to the House of Very Little Barbecue. Granted, it's a sad imitation of Disneyland - complete with a teacup ride, flying elephants, and the like. but it beats paying out the nose to have your young'un walk around all day and only ride 3 crappy rides. Assuming, of course, that Branson doesn't kill you first. That city is a black festering hole of evil.